It’s always good to hear those stories about folks who will go the extra mile to help a truck driver. 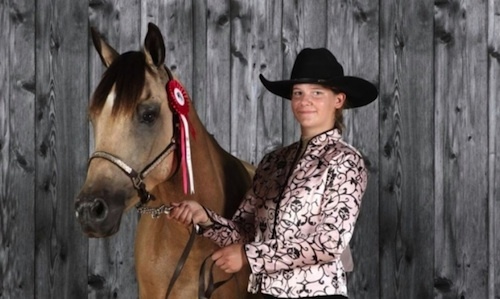 But here's a story about an 18-year-old girl who went many extra miles, through a winter storm, on her horse, to bring a stranded truck driver some morning coffee. Then she did it all again to bring him dinner later that day and she certainly didn't expect her good deed would go viral. Truck driver, Peter Douglas, was making his way to Brandon, Manitoba from Boissevain on Monday afternoon as a major winter storm began descending on the Canadian prairies. Familiar with the terrain and keeping watch on the weather, he thought he would be able to make it to Brandon to complete his delivery job. But he underestimated the storm and by about 4 p.m., the highway through the Souris Valley was impossible to drive. "The Souris Valley was one sheet of ice and I couldn't pull the whole thing," he says. "I was trapped. With all my brakes on, I still started sliding backwards." Douglas had no choice but to stop driving and sit stranded on the barren highway. His one saving grace was that he at least knew his truck was parked in view of one of the highway cameras. "My family, my bosses and it seems everyone on Facebook knew exactly where I was." It turned out that a complete stranger also knew where he was. Eileen Eagle Bears was keeping an eye on the traffic cams with her mom from their home located a few miles off the highway. When they spotted the lone semi-truck on the Highway 10 camera, the girl decided that if the truck was still there in the morning she'd bring the driver some coffee. The next morning Eagle Bears checked the cam and sure enough the truck was still there. 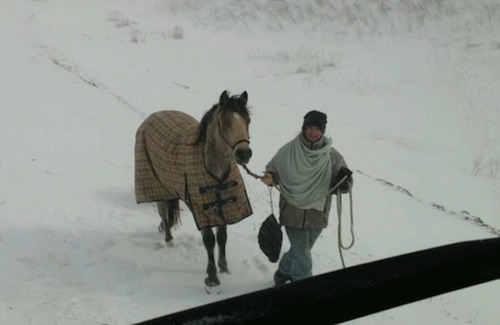 The storm hadn’t let up but she knew her horse, Mr. Smudge, was tough enough to make the round trip. She filled a Thermos with hot coffee and they hit the trail. It would be an hour of deep snow, ice, and hilly terrain but she was determined and so was Mr. Smudge. "There was a lot of ice on the road from the rain that we had got and drifts were bad in a few places. But the morning wasn't too bad to get there and come back," she explains. Eagle Bears says when she got to the truck, the driver was still sleeping so she had to wake him up. Needless to say, Douglas was shocked to wake up and see a girl and a horse outside of his window. "Lo and behold, first thing in the morning, I look out my window and there was a horse and a young lady by the name of Eileen Eagle Bears," Douglas explains. "She had to walk that horse half a mile up that hill and half a mile down because it was so icy. Blew me away," Douglas said. He was extremely grateful for the coffee and surprised again when Eagle Bears and Mr. Smudge came back a second time later that day with water and a big thermos of stew and potatoes. 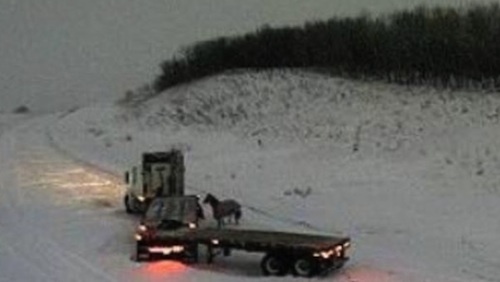 The truck driver ended up spending 28 hours stranded on the highway before he finally got towed. He says what Eagle Bears did made all the difference and it’s something he’ll never forget. "I just did it because I wanted to help, so I just feel like I did the right thing," Eagle Bears says. "He was just really glad that someone knew that he was there and that someone cared." What Eagle Bears didn’t expect, was all the media attention she’s gotten since the story went viral. "It is overwhelming. I had gotten back and my mom had posted just a post on Facebook. And there was a few likes at the beginning, but we went back and there was just more and more, and it just totally blew up." I've been stranded before in bc for 42 hours because of a rock slide and once for 19 hours cause of an avalanche I was lucky to have a bunch of caned goods. Just wanna say thank you to Eileen Eagle Bears You are an Angel I hope that you will be very blessed "Forever"
Truck drivers have a good rep amoung most people and we trybto reward them. Thsnks young woman cause that truck driver could be my son ! And hopefully my daughter! Maybe he should ask her to,marry him then,it would be a good movie! Such a sweet act of kindness Eileen, may you be BLESSED again, again and again! Great job parents! dont see that much anymore!!! my hats off to eileen and mr.smudge!!!!!! That's one very special young lady, this trucker says thank you. Eileen Eagle Bears thank you for what you did for that Driver. Good deed by the young lady & her horsie. God Speed Love Home Amen and bless all..
An act of true kindness! Eileen, it seems, considered her unselfish acts of kindness to be just the sort of thing that civilized normal regular people do for each another. In the overly judgemental world of the white privileged, where people are so involved in clambering up the ladder of success, unfortunately, such kindness is so unusual that it is notewarthy. I've found that if you will be viewed with suspicion if you go out of your way to do something nice for a stranger. Do it and see what kind of a reaction you get. Just think what a different world it would be if the people in it were to perform random acts of kindness and "Pay it Forward" (movie). The Water Protectors are kindly people who were driven from the camps in Standing Rock by hate. This was a sad day for us all because it only happended because of the many who went well out of their way, with outright lies, to vilify people that they didn't even take the time to get to know. Shame on them. They better hope there is no God cause when their time comes they're going to have some explaining to do. Another racist!! Proves you don't have to be white to be racist! All white people arent privileged!